OnePlus might be readying up to start flogging a 'OneWatch' according to two leaked images sent anonymously to BGR India. 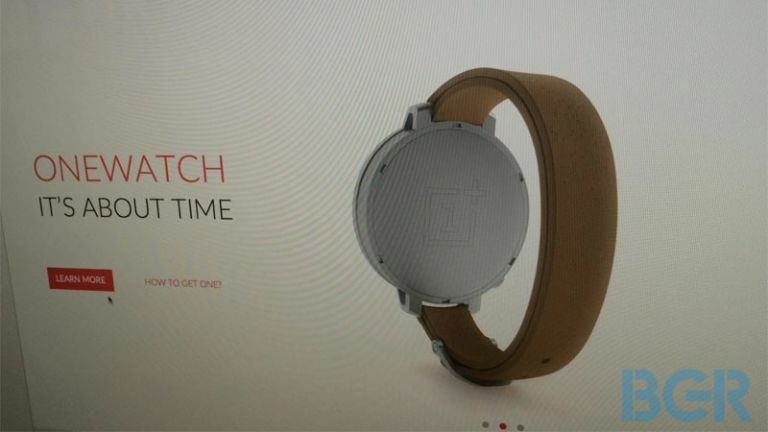 The first image shows off a dedicated web-page for what appears to be a OnePlus-branded timepiece. The watch sports a brown strap, metallic silver casing, and is facing away from the camera. The second image reveals a OneWatch concept sketch detailing possible specs and features of the purported OnePlus smartwatch. It appears that the watch will sport an OLED screen, a sapphire glass display, and a curved battery. Interestingly the curved battery marker points to the strap, indicating a band-based power source. The sketch also references Qi technology, which is a wireless charging standard that can juice up devices over a distance of 4cm. The physical design of the watch also includes leather straps, titanium borders, and a configurable button on the right side of the watch face-up. A round watch-face looks like OnePlus' chosen aesthetic, which mirrors other hot stuff smartwatches like the Moto 360 and HP's mystery designer timepiece. OnePlus caused quite a stir in the tech scene when it announced its One smartphone back in April, offering hefty specs for a wallet-friendly price tag. The OnePlus One runs off Android, so there's a good chance the OneWatch will adopt Android Wear as its operating system of choice. Considering the sketches look pretty detailed and the watch appears to have its own launch website, it's a fair guess that the OneWatch isn't too far off. Unfortunately, there wasn't any word of a specific release date or price point, though we'd imagine the mark-up will be pretty low in keeping with the One smartphone's marketing tactic.